It is indeed a great pleasure to welcome Your Excellency and Madame Valerie Trierweiler on your first State Visit to India. Our Government is particularly honoured that you have chosen India as the first country in Asia for such a visit. It is a matter of satisfaction that your delegation includes several distinguished Ministers of your Cabinet. 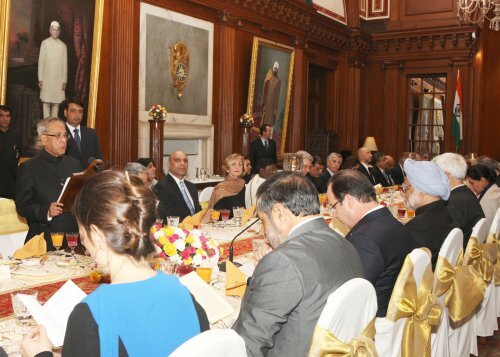 Your visit to India is yet another occasion to celebrate the high level of understanding between India and France. We have long nurtured a close and substantive relationship based on shared principles and values – and our many convergences on regional and global issues of common concern. It has thrived on our mutual respect, regular dialogue and constructive exchanges. In the people to people context, we have a unique history. Indians have sacrificed their lives alongside French soldiers in some of the fiercest fighting on French soil during the First World War and in other theatres during the Second. The people of India have held France in great esteem. We have admired her open society and its rich legacy of artistic expression, literature and philosophy. We recall the visit of Swami Vivekananda to Paris in 1900 and Nobel Laureate, Rabindranath Tagore’s close relationship with French scholars and artists which contributed to the realisation of the cherished Vishwa Bharath University at Shanti Niketan. The writings of Rene Descartes found resonance in the works of our own great philosophers; and Nobel Laureate, Romain Rolland, who published his conversations with Tagore and Mahatma Gandhi, was strongly influenced by our philosophy of Vedanta. The slogans of the French Revolution, "Liberty, Equality and Fraternity” were embraced by the framers of the Indian Constitution. When the 1954 Agreement was signed between our Governments on the French Establishments in India, Pandit Jawaharlal Nehru, India’s first Prime Minister had rightly anticipated that the revised arrangement would give birth to a new closeness between our two countries. True to his prophetic words, our enduring friendship, marked by our bilateral co-operation in diverse sectors has had rewarding outcomes to our mutual benefit. As a result we have, today, more than 700 French enterprises invested in India; and Indian companies are increasingly exploring opportunities in France. Our bilateral trade has grown to almost 9 billion US Dollars in 2011-12 and France is today the 9th largest foreign investor in India. Our joint initiatives which include technology transfer and collaborative development in the strategic areas of space, defence production and civil nuclear co-operation have been particularly successful. We very much appreciate that France has been one of India’s oldest, closest and most reliable partners. ISRO’s launch in October 2011, of the Megha Tropiques research satellite jointly developed by ISRO and the French Space Agency has facilitated the harvesting of valuable data for understanding weather – which is of tremendous worth to both our countries as well as scientists around the world. We have a long standing and fruitful collaboration in the railways sector. The Indo French Centre for the Promotion of Advanced Research, has set an example that other countries seek to emulate. Excellency, the success of our joint efforts reminds us that India and France have similar aspirations. While preserving the advantages of globalization, we are both committed to working bilaterally and multilaterally to shape a new global agenda for inclusive growth. We both agree on the need to revitalise global governance and the reform of its principal organs. I take this opportunity to reiterate that India appreciates the support consistently extended by France to India’s rightful claim to a permanent seat at the United Nations Security Council. India desires to see that her external environment is secure so that our country can develop in peace. We are concerned when there is instability in our region; and we value constructive consultations with all concerned on the issues that must be addressed carefully. The sea lanes in the Indian Ocean, similarly, are threatened by acts of piracy, evoking the necessity of closer co-ordination in maritime security. As countries that have repeatedly experienced terrorist attacks, we must give due priority to addressing the threats to international peace and security posed by terrorists and their facilitators. Excellency, one of the happiest elements in the everyday contacts between our people is the spontaneous current of cultural exchanges between them - even beyond our official programmes. ‘Namaste France’ and ‘Bonjour India’ Festivals have set a new paradigm of expectations and this year, both Governments will jointly bring out Bonjour India 2013. I have no doubt that under your leadership, our strategic partnership will continue to progress and mature in the years to come. With these words, I once again welcome Your Excellency, President Hollande, Madame Valerie Trierweiler and your distinguished delegation. - To lasting friendship between India and France.